We went out yesterday for our Boxing Day Constitutional along the Regents Canal to Victoria Park - expecting to find lots of people also out walking - but we saw very few people. Maybe they had all gone to to the 70% discount sales? 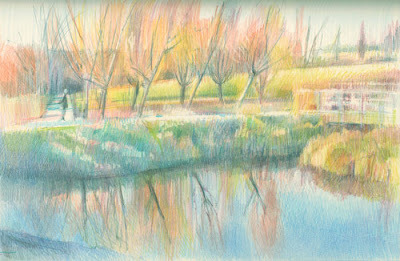 This is the Ecology Park Pond which I sketched when I was reviewing the Derwent Safai Journal. Except yesterday the sky was an intense blue overhead - as was the pond - and the pollarded willows didn't have any leaves. The low afternoon sun in a very clear blue sky created a brilliant mix of complementary colours. I have to confess that it was so cold that the coloured pencil got added when I got home! NEAC Discussion Panel - Can you teach art or drawing? Last week, the New English Art Club arranged a Discussion Panel at its Annual Exhibition in the Mall Galleries - on the topic of "Can you teach drawing or painting?" I'd drawn the panel at the discussion at last year's exhibition and wanted to do the same again so made sure I got there in good time and had a good view. Nobody on the Panel sat still of course so the sketch was completed in snatched moments as people settled for short periods - and I was darting back and forth between people all the time I sketched. I find that the most difficult thing when sketching people like this is trying to guess which is the 'comfy' pose - the one an individual will always return to whenever they move. I should have posted about the discussion last week as, although interesting, I can't now remember some of the points made in the debate. 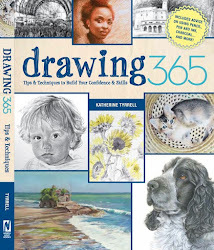 I do remember there was a long discussion about the various models of teaching drawing and painting which have been used over time - in particular comparing how people were taught themselves in the past and how they have to teach now - within whatever context. 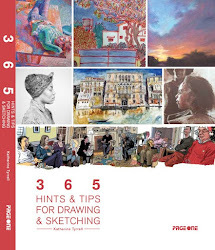 Having qualified as a teacher myself in the dim and distant past, I do remember thinking I was less interested in how drawing and painting can be taught and more interested in how people learn to draw and paint in an effective manner (ie going beyond achieving a likeness). In my view, in order for teaching to be effective the approach used does need to be based in an understanding of how people learn at different stages of their development as an artist. Sometimes you need to learn how to do and sometimes you need to be left to get on with trying to find what you can do with what you've learned. It did strike me me that maybe some of the approaches employed over time haven't always factored in how learning works - and that some approaches will have too structured and constrained for some and too vague and loose for others. I guess the question is a good one - even if it's not always easy to answer! 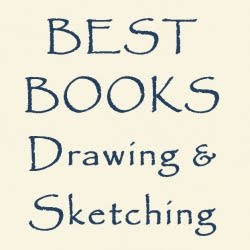 Note: NEAC has a Drawing School called, unsurprisingly, the New English School of Drawing. The information on the website is somewhat out of date but does provide a contact email for latest courses. I went sketching at Somerset House with the Friends of the Bankside Gallery/RWS three weeks ago. These are the remaining sketches from that trip. I should explain that it drizzled virtually non-stop all the time. I tried working outside but my sketchbook hates water and started to ripple so virtually all of what I did was done from indoors! 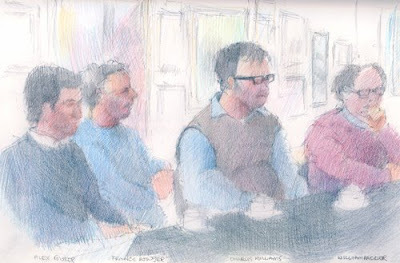 This sketch is of people sat in the foyer in between the Courtyard and the Terrace at the back which looks out over the Thames. 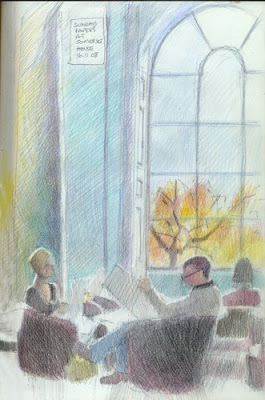 They just sat very still reading their papers - and I couldn't resist drawing them against the fabulous windows and columns and the coloured greys of a late autumnal day. 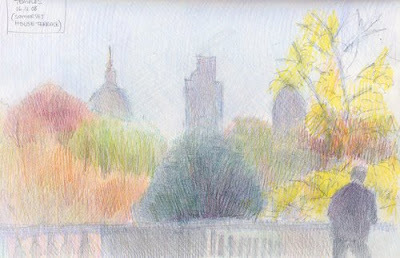 The sketch below was done from the rear terrace - which is huge. At one end I could see the three of the tallest buildings in the City of London above the trees which were turning colour but were still holding on to a great deal of leaves. Tower 42 - the former NatWest Tower (1980) which used to be the tallest building in the UK until One Canada Square was built at Canary Wharf in 1990. 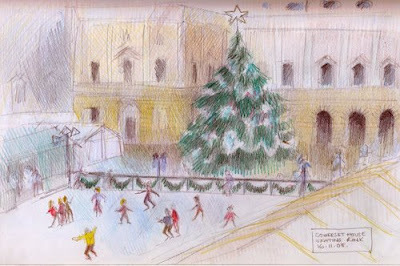 See also my sketch of the ice rink in Anyone for skating? Somerset House is a great location for people who wanting somewhere to sketch in London as it offers lots of opportunities in all weathers terms of both interiors and outside locations plus it has good refreshment facilities and conveniences. Always a boon if you're staying in one place for any length of time! Somerset House is inbetween the Strand and the the River Thames - just below the Aldwych. It has a very long and complicated history and was once one of the Royal Palaces. It was built in 1547 and was subsequently altered and added to by both Christopher Wren and Inigo Jones. Queen Elizabeth I lived there when her sister Mary was the Queen and Oliver Cromwell lay in state here before his funeral. The Royal Academy of Arts had its first home here and for very many years it was the home of the Royal Society, the Navy Board, the Inland Revenue and the Stamp Office and was the place where all the details of births marriages and deaths were lodged. Latterly it's become a centre for the visual arts, music and film. The Courtauld Institute of Art, including the Courtauld Gallery, now occupy space here plus there are workshops and learning ppportunities. I visited Somerset House a little while as they were setting up the outdoor ice rink. It wasn't yet open but it had some people skating nevertheless. Unfortunately I found it completely impossible to find anywhere you could see what was going on while outside - so retreated back inside Somerset House and found a staircase with a window which let me look down on the rink and the skaters. However it did mean I had to sketch standing up which severely limits my sketching time so I think I need to get out and see a few more rinks! Judging by the photograph on the Somerset House Ice Rink website I maybe ought to try going back after dark! The best rink in London for looking down on skaters is the one at the Natural History Museum as it has a great viewing platform. Watermarks is a new team blog for a small community of artists who create art from water - and I'm one of them! 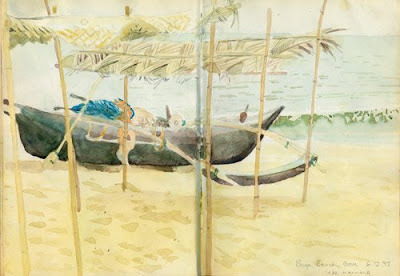 This blog is going to be linked to it as this is the blog in which I post most of my sketches and drawings of water. 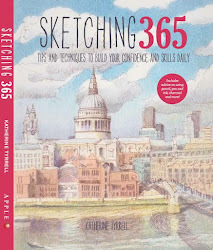 and me - and I live very close to the Thames and sketch it often, plus I'm very partial to a nice lake or canal! In the next week, there will a series of posts on the blog introducing all the members of the team. It's actually very interesting how many of us either live near to a major mass of water or have lived very close to water in the past. You can see photos and drawings of the members in Welcome to Watermarks. You'll also find links to all our individual blogs in the sidebar plus links to various drawing and painting projects and series we've undertaken in the past. What do you think of the idea and the new blog? Do come and visit and tell us what you think.